Printed in Portrait A4 high quality gloss paper with 80 pages crammed full of photographs and 1/35 scale plans. So exactly what do you get for your money. It has 225 black and white photographs with 55 colour photographs and 3 colour illustrations. The plans are aimed at correcting the internal engine covers and seats also minor details on the wheels and chassis, more about this later. 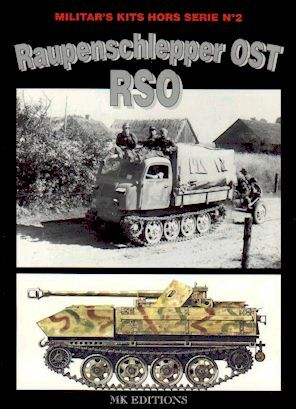 The biggest set of plans and drawings are for the RSO PAK 40 gun cradle and the Ambulance version. Actual photographs of preserved vehicles are used for close up details and a lot of original wartime photographs are also included. I would like to make one point about using original photographs can the editors please include the negative numbers and the addresses of the museums archive section in future. Basically it helps to correct some of the shortcomings with the only kits available from Italeri. Plus giving one scratch build for the ambulance version. I like the format and layout but some of the photographs are a little too small and sometime too many crammed onto a page. The authors are to be congratulated on a job well done and since this vehicle is a particular favourite of mine I rate the book highly. However it does have several faults, the model makers have in the main used the original engine covers in the kits and modified them. This applies to all the kits; sorry chaps but Italeri have got all of them wrong big time. To build the engine covers correctly for all of the kits you have to have the following reference books to hand .Die Rad und Vollketten Zugmascinen by W J Spielberger and Model Fan magazine June 98. Each engine cover is a scratch build on its own right. Apart from some photographs being too small and crammed and the lack of research for the correct engine covers. If the RSO is your kit then as long as you have access to the other books this will help and clarify a lot of details and will with cross reference work prove very usefull. I recommend it and it should find a space on the reference shelf.